Cow Lane cotton spinning mill, Rainow, stood in the Dean valley at the foot of Kerridge Hill. The picture, right, is the only picture we have of this mill which was abandoned in the late 19thC. 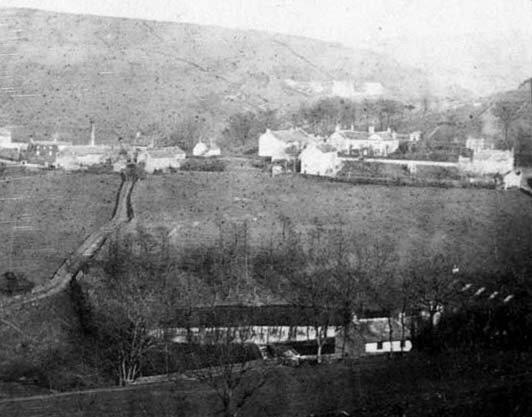 Note that there is a Cow Lane in Bollington – this is not the same one! Rainow village is in the background of the picture. The road to the left is the original Cow Lane. Today the name refers to another road just off the right of the picture. Cow Lane mill is at the bottom of the picture and consists of two buildings; the left one looks like it might have been a house and the right one, with roof skylights on the extreme right of the picture, looks like the main mill building. The pale stripe through the trees is the reflection off the mill pond. The bright mark descending from the centre of the pond is the overflow back into the river, a tributary of the river Dean, which flows right to left on the far side of the pond. The stone wall along the bottom of the picture borders another track that gave access to the mill. This continued to the right as a road to the present day Cow Lane and was actually the main entrance to the mill. The mill employed water power for the original wheel. Later an increased power requirement necessitated the construction of a boiler house, chimney and steam engine. None of this is visible in the picture; it was located off the right of the picture. Today there are no buildings on the site. Various parts of the stonework remain to show where the structures were located. In 2008 the Kerridge Ridge & Ingersley Vale (KRIV ) project excavated the ground where the main mill building stood and identified many of the details of the layout. The site was extensively recorded and then refilled to protect the remains. A public footpath passes through the site allowing inspection today. The picture comes from probably the oldest individual collection in the Civic Society’s picture collection and dates from the 1860s, the dawn of photography. The mill was located in the trees towards the end of Cow Lane. The original Cow Lane is the track running at the top of the field to the right of the trees.